I replay games I like a lot. Particularly those games that offer up multiple experiences and a variety outcomes. The Witcher 3: Wild Hunt is one of my all time favourites and given that this year is also the 10th Anniversary of the franchise, what better game to revisit. Full disclosure, this will be my 4th FULL playthrough (I’m not counting the playthroughs I started and didn’t finish, lest you all judge me for the shocking amount of my life I’ve spent exploring the Northern Kingdoms). When the final chapter in The Witcher series was released back in May of 2015, I’ll be honest, I wasn’t expecting much. It was a game launched by a relatively small Polish developer, CD Projekt Red, that’s previous two entries in the series were PC exclusives (though the sequel was later picked up by Xbox for the 360). Sure, I’d heard of The Witcher, but I’d written it off as yet another one of those cute little RPG’s that seem to dominate the PC market. Hardly a AAA console title right? How wrong I was. For those that are unfamiliar with the series, each instalment is based on a series of novels by Polish author Andrezj Sapkowski and follow the story of a witcher (a human, who is mutated to become a lean, mean, monster-massacring, machine) known as Geralt of Rivia, as he goes from village to village finding monsters to slay and sorceresses to sleep with, usually getting dragged into a magical and political scandal along the way. The game consists of a truly massive open world, and easily over 100 hours of gameplay spent exploring the world and meeting an array of surprisingly unique NPC’s. The Witcher 3: Wild Hunt begins almost exactly where The Witcher 2: Assassins of Kings left off. After the Northern Realms are attacked by a Nilfgardian occupation force, Geralt receives a letter from his lover, Yennefer of Vengerberg (one of 2 main love interests in the series), saying she must meet with him urgently, eventually notifying him of the disappearance of his ward/protégé (and much loved adoptive daughter) Ciri. 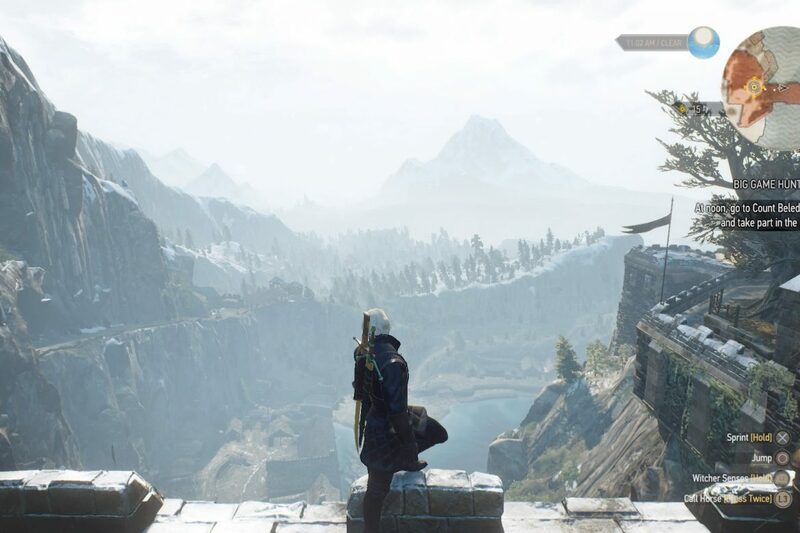 The game then effectively becomes a chase to find Ciri, before the sinister group of spectral elves known as The Wild Hunt, who want to use Ciri’s power for evil. It’s hardly an original plot, but the well structured and well paced narrative keep you invested from the get go. My God this game is beautiful. Each area region is vastly different to the other, and yet they all blend together seamlessly. They feel unique, and yet are clearly part of the same world. Everything feels alive, whether you’re sneaking around the backstreets of Novigrad with Triss Merigold as you try to smuggle all the mages out of the city, battling a fiend in Crook Back Bog alongside Velen’s very own Bloody Baron, or getting drunk and catching up with your old friend Crach An Craite at the recently departed Jarl’s Wake in Skellige. Ah, Skellige. If there was one place that my revisit really made me appreciate, it was the archipelago that forms this Northern Kingdom. Don’t get me wrong, Novigrad is great, and Velen has some truly stunning sunsets, but Skellige just feels so…alive! Riding through the harsh, rocky, landscape, you really get a feel that at any moment you could stumble across something deadly, be that a drunken, half ‘Viking’ half ancient Scotsman, a wild beast, or a group of wraiths that crawl out of the mist as you approach that really cool looking lighthouse. Skellige evokes a truly unique feeling, one that I can’t entirely place. Perhaps it’s a collection of feelings that simply contradict one and other, a longing to be in such a gorgeous environment, but a reluctance to ever step foot in such a dangerous one. Whatever it is its beautiful, but in the most unpleasant of ways. How do you choose?! Please, somebody tell me. Four playthroughs and I’ve never been able to choose. 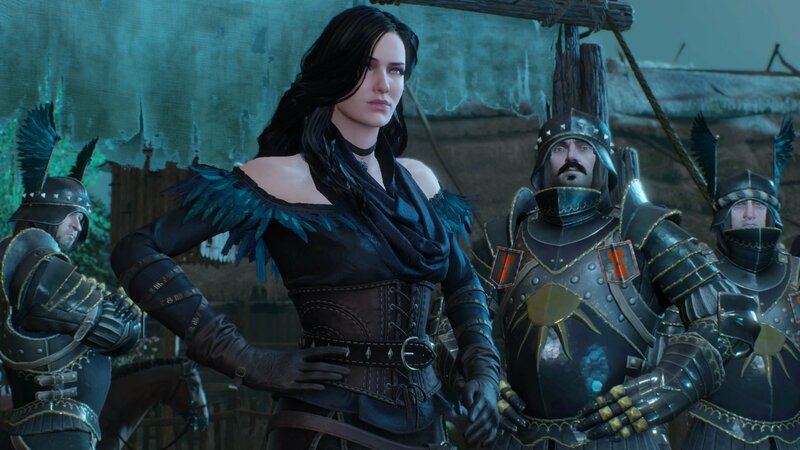 It’s the same cycle every time, Yennefer treats me like a dog at the very start, she’s cold, I begin the game absolutely adamant that Geralt will not end up with her. He gets to Novigrad and catches up with Triss, she’s as beautiful as ever, she’s so brave helping him with Menge, they have a romantic date at the Venglebud’s ball, they rescue a bunch of mages from an oppressive regime, and then find themselves standing on a dock, in the middle of the night, her ship about to set sail and I can’t let Geralt let her go. They stand at the top of the lighthouse, watching her ship leave, and discuss their future together. They’re going to live happily ever after, the decision has been made. Then Geralt arrives at Skellige and sees Yen. And that’s where it all goes wrong. Yes she’s cold, yes she’s bossy, yes they’ll probably end up living miserably ever after, but I feel like they’re destined to be together. And unfortunately, the Witcher 3 is not Mass Effect, you can’t just keep stringing them along safe in the knowledge that it’ll work out. Deciding between everyone’s two favourite sorceresses is by far the hardest decision I’ve ever faced in a game, no joke! 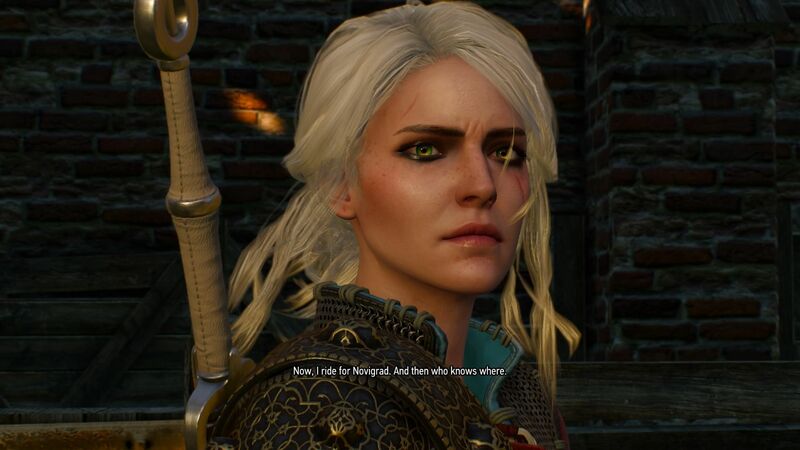 I’m not going to lie, I did fall a little bit in love with Ciri during my first playthrough. Which is all kinds of weird when you consider I spent the entire game playing as a guy who is basically her adoptive father (the therapist will love that one). Not that, she’d have me anyway, we all know she’s not that way inclined. Don’t even try and tell me that that speech option was just to get Astrid to stop setting her up with Skjall, I’ve read the books, I know what it meant. 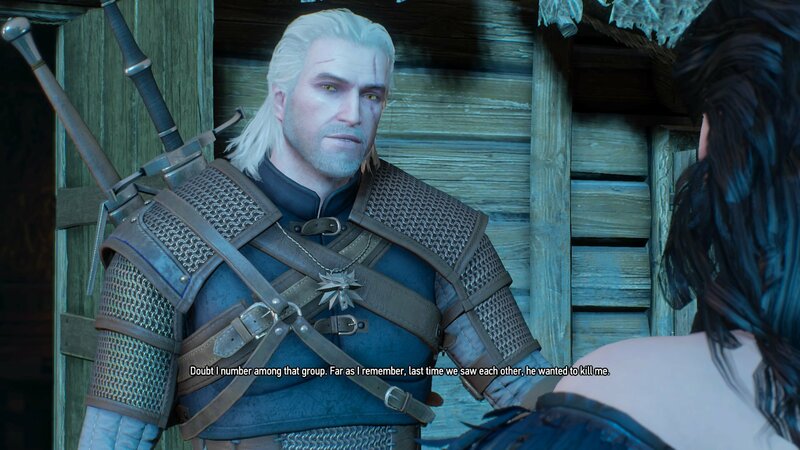 Though I have to give CD Projekt Red credit for their inclusion of the father/daughter dynamic. They explored a relationship we seldom see in video games, and as the game progressed my love for Ciri began to echo that of the love a father has for his daughter, I wanted to protect her from the Wild Hunt sure, but I also wanted to help her gain control of her powers, to see her live up to her potential. That made my most recent play through all that harder. 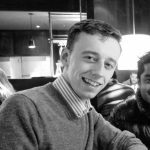 Yes, I’m talking about…. During my first three playthroughs I always got a good ending, a varied ending, but one that I was happy with. This time, I decided to go for that much talked about ‘bad ending’. Unlike with most RPG’s, the bad ending is not dependent upon you being an arse (infact I’d argue that its impossible to be true to the character of Geralt without being an arse at least 60% of the time). No, to get this ending you have to be selfish. Geralt ended up loveless, daughterless, and utterly alone in the world. It was brutal, but I can’t help feel that it was an oddly fitting end to Geralt’s tale. 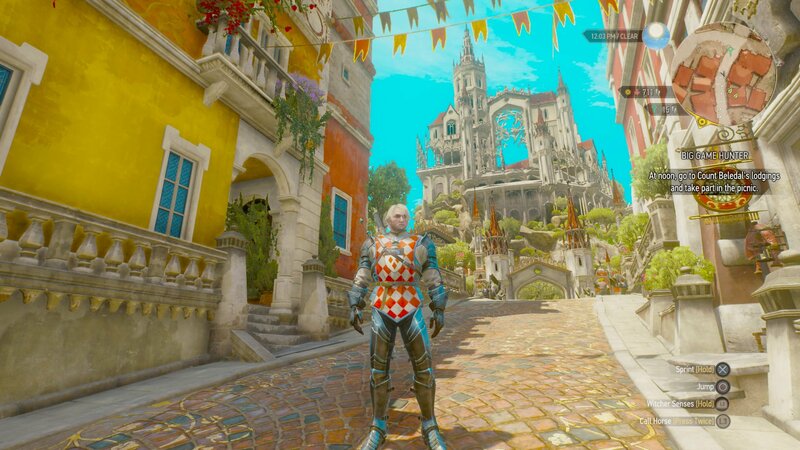 It almost feels wrong to call Hearts of Stone and Blood and Wine ‘expansions’. The former gave us some of the single greatest story telling of the whole series, incredibly memorable missions and a former lover/friend (depending on your actions in the very first game) in the form of Shani. Blood and Wine, oh sweet, sweet, Blood and Wine though. Had this been a big studio title, Blood and Wine would be called The Witcher 4, cost £50, and be released 3 months too early, riddled with glitches (we’re looking at you Ubisoft). Fortunately for us, CD Projekt Red are not a big studio, and they actually care about their consumers. Giving us a whole new region to explore in the Dutchy of Toussaint, bursting with character and European fantasy, we’re talking knights, jousting tournaments, and vampires with new monsters and mutations to boot! THIS is how you do DLC. The Witcher 3: Wild Hunt revolutionised what we’d come to expect from 4th generation titles, and will go down in the annals of gaming history alongside the likes of GTA San Andreas and Half-Life 2 as one of the greatest games of all time. Heck, two and half years later, it is still one of the most beautiful games on the system. All images are screen shots by the author taken during game play of The Witcher 3: Wild Hunt by CD Projekt Red.